This week in our series, we look at the presidential election campaign of nineteen fifty-two. President Harry Truman decided not to seek re-election. The continuing war in Korea and economic problems at home had cost him the support of many Americans. His Democratic Party needed a new candidate for president. In the spring of nineteen fifty-two, Harry Truman offered his support to Adlai Stevenson. Stevenson, however, said he was not interested in any job except the one he had as governor of Illinois. Someone asked what he would do if the Democratic Party chose him anyway as its presidential candidate. Stevenson jokingly answered that he would have to shoot himself. So, President Truman and other party leaders discussed different candidates. Each one, however, seemed to have some political weakness. The Republican Party was also discussing possible candidates. It was much easier for the Republicans to choose. Earlier, General Dwight Eisenhower had said he would be interested in running for president. Eisenhower was the highly respected commander of Allied forces in Europe during World War Two. Many members of both parties supported "Ike," as he was popularly known. Eisenhower agreed to campaign as a Republican. His closest competitor for the Republican nomination was Robert Taft. Taft was a senator from Ohio and the son of a former president, William Howard Taft. Senator Taft had strong support among Republicans for his conservative positions. But he did not receive enough votes at the party's national convention to defeat Eisenhower for the nomination. DWIGHT EISENHOWER: "Ladies and Gentlemen, you have summoned me on behalf of millions of your fellow Americans to lead a great crusade -- for freedom in America and freedom in the world. I know something of the solemn responsibility of leading a crusade. I take up this task, therefore, in the spirit of deep obligation. Mindful of its burden and of its decisive importance, I accept your summons. I will lead this crusade." Eisenhower chose Senator Richard Nixon of California as his running mate for vice president. Nixon was known for strongly opposing communism. Earlier, as a member of the House of Representatives, Richard Nixon had led the investigation of a former State Department official, Alger Hiss. Hiss was accused of helping to provide secret information to the Soviet Union. He denied the accusation and was never charged with spying. But he was tried and found guilty of lying to a grand jury and was sentenced to prison. Democrats opened their presidential nominating convention in Chicago, Illinois, ten days after the Republicans closed theirs in the same city. 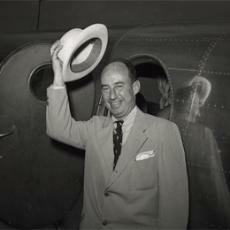 Illinois Governor Adlai Stevenson welcomed the delegates, but still seemed like he did not want to run for president. That only made the delegates want him even more. They were unable to choose a nominee on the first two votes. Then, on the third vote, a majority of the delegates chose Adlai Stevenson. And he accepted. He urged Democrats to campaign with honor. ADLAI STEVENSON: "Let's talk sense to the American people. Let's tell them the truth, that there are no gains without pains, that we are now on the eve of great decisions, not easy decisions, like resistance when you're attacked, but a long, patient, costly struggle which alone can assure triumph over the great enemies of man - war, poverty, and tyranny - and the assaults upon human dignity which are the most grievous consequences of each." A political observer described the differences between Adlai Stevenson and Dwight Eisenhower this way: Stevenson was a man of thought. Eisenhower was a man of action. The Republican Party hired an advertising agency to design a campaign to "sell" Eisenhower and Nixon to the American public. ANNOUNCER IN COMMERCIAL: "The man from Abilene. Out of the heartland of America, out of this small frame house in Abilene, Kansas, came a man, Dwight D. Eisenhower. Through the crucial hour of historic D-Day, he brought us to the triumph and peace of V-E [Victory in Europe] Day. Now, another crucial hour in our history. The big question..."
MAN IN COMMERCIAL: "General, if war comes, is this country really ready?" EISENHOWER: "It is not. We haven't enough tanks for the fighting in Korea. It is time for a change." ANNOUNCER: "The nation, haunted by the stalemate in Korea, looks to Eisenhower. Eisenhower knows how to deal with the Russians. He has met Europe's leaders, has got them working with us. Elect the Number One Man for the Number One Job of our time. November fourth, vote for peace. Vote for Eisenhower." Adlai Stevenson was known as an intellectual -- an "egghead." He dismissed some traditional political advisers and replaced them with fellow "eggheads" when he launched his campaign. The biggest issue in the nineteen fifty-two campaign was communism. Stevenson said America needed to guard against it. Yet he repeatedly criticized the actions of Senator Joseph McCarthy. For years, the senator from Wisconsin had been denouncing government officials and others as communists. Eisenhower did not criticize McCarthy, even when the senator accused Eisenhower's good friend, and fellow World War Two hero, General George Marshall, of being a traitor. The Republican campaign went smoothly until Nixon faced a campaign finance dispute. The vice presidential candidate was under pressure to withdraw. That led to Nixon's famous "Checkers" speech. He made the speech on national television on September twenty-third nineteen fifty-two. In it, he denied any wrongdoing. He defended his actions regarding the disputed funds -- and his decision to keep a special gift from a political supporter. RICHARD NIXON: "One other thing I probably should tell you, because if I don't they'll probably be saying this about me, too. We did get something, a gift, after the election. A man down in Texas heard Pat on the radio mention the fact that our two youngsters would like to have a dog. "And believe it or not, the day before we left on this campaign trip we got a message from Union Station in Baltimore, saying they had a package for us. We went down to get it. You know what it was? It was a little cocker spaniel dog in a crate that he'd sent all the way from Texas, black and white, spotted. "And our little girl Tricia, the six year old, named it "Checkers." And you know, the kids, like all kids, love the dog, and I just want to say this, right now, that regardless of what they say about it, we're gonna keep it. The speech was a major success. Many Republicans voiced support for Nixon to stay on as Eisenhower's running mate. And Eisenhower agreed. A few weeks before the election, Eisenhower made a powerful speech. He talked about ending the war in Korea. DWIGHT EISENHOWER: "Now, where will a new administration begin. It will begin with its president taking a firm, simple resolution. That resolution will be to forego the diversions of politics and to concentrate on the job of ending the Korean War, until that job is honorably done. That job requires a personal trip to Korea. Only in that way could I learn how best to serve the American people in the cause of peace. I shall go to Korea." Adlai Stevenson also gave a powerful speech before the election. In it, he told of seeing "an America where no man fears to think as he pleases, or say what he thinks ... an America where no man is another's master -- where no man's mind is dark with fear." Adlai Stevenson spoke of a nation at peace with the world -- "an America as the horizon of human hopes." Americans voted in November. Eisenhower won almost thirty-four million votes. That was more than any other presidential candidate had ever received. Stevenson won about twenty-seven million votes. Dwight Eisenhower was sworn in as America's thirty-fourth president in January of nineteen fifty-three. He was sixty-two years old. Many problems awaited the new Republican president. Republicans had only a small majority in Congress. Many of them were very conservative and unlikely to support many of Eisenhower's programs. The cost of living in America was rising. Senator Joseph McCarthy was still hunting communists. And the war was still being fought in Korea. But Ike had a lot of experience serving his country. Dwight Eisenhower came from a large family in Abilene, Kansas. They did not have much money. He received a free university education when he was appointed to attend the United States Military Academy at West Point, in New York state. He remained in military service for many years. He was a top Army officer by the time the United States entered World War Two in nineteen forty-one. In June of nineteen forty-four, he led the Allied D-Day invasion of Europe. In nineteen fifty, President Truman named him supreme commander of NATO, the North Atlantic Treaty Organization. 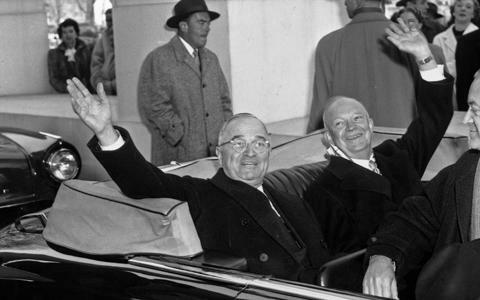 When Dwight Eisenhower ran for president, supporters shouted "I like Ike!" People like him because he always seemed calm under pressure. As president, one of the first pressures he would have to deal with was the continuing war in Korea. This was program #204. 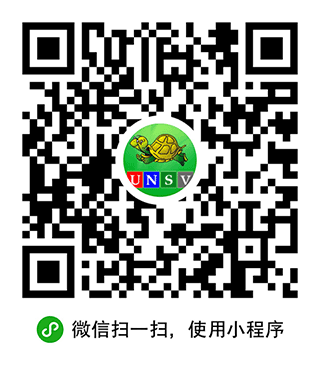 For earlier programs, type "Making of a Nation" in quotation marks in the search box at the top of the page.